Whoever organized this collaborative workshop between two of Indigenous music's most potent forces is a genius. 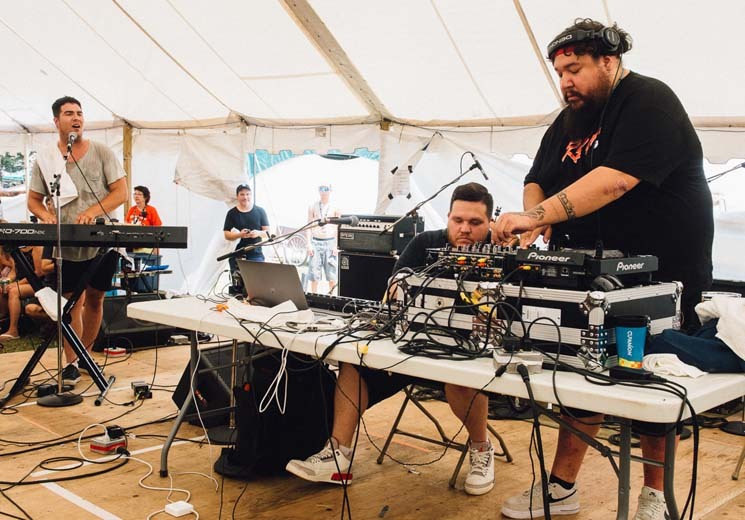 Both A Tribe Called Red and Jeremy Dutcher take traditional music and sounds from their communities and infuse them with contemporary musical style — Tribe deal in electronic dance music, while Dutcher takes a neo-classical approach. Both parties have been eager to collaborate with each other for some time, and they certainly made the most of it during the workshop. Starting with "Mehcinut," the opening track to Dutcher's debut album Wolastoqiyik Lintuwakonawa, Dutcher's solo rendition set the scene before the voice of the late John Trudell delivered the titular intro to Tribe's latest album, We Are the Halluci Nation, with Dutcher's plaintive keys on top. From there, the collaborative elements exploded in creative furor: Dutcher looped vocals on top of Tribe's "The Muse"; Tribe's 2oolman crafted rapid-fire drum pad beats on top of Dutcher's "Pomok naka Poktoinskwes"; Dutcher sang the hook to Tribe's "Eanan." Each party's respect and admiration for each other's work manifested in a desire to add their talents to the other's tracks in the spirit of mutual improvement. The most powerful moment came when Tribe dropped a sample of Saul Williams' contributions to their track "The Virus," of the phrase "We are not a conquered people." Dutcher immediately started to sing the line, working it into the forefront of the song, his operatic tenor at full force. At the workshop's conclusion, when Tribe officially welcomed Dutcher to the Halluci Nation, their loose cohort of collaborators and inspirations, with the promise of a guest spot on their upcoming record, it was merely a formality — Dutcher and Tribe's natural chemistry and kinship seemed preternatural from the outset.